It seems like most people really like my endlessly stalled fanfic The End of the SWAT Kats!, but it seems far fewer know of its equally stalled script adaptation. While they're essentially the same story, i.e., the SWAT Kats get found out and deal with the fallout of it before being asked to save the city one final time from arch-enemy Dark Kat, I feel that the script version contains enough differences that it's its own creature. So I'm going to post links to it here, and see what all you guys think. Wow! It's great! You really streamlined it. I was kind of hoping there'd be an epic battle between the SK's and Dark Kat at the end of that last part. You were definitely leading up to that in the fanfic version of this. But then again, it's not finished yet, so there's always time for that. I like the character development between Callie and Feral, hopefully we get to see more of that as well. And Manx...he's such a coward...why am I not surprised... Anyway, I kind of have an idea as to how this might end, but I'm not going to give away my predictions. I hope you definitely continue this soon. Wow,this is very amazing fiction which I read,interesting conceptual,storyline and much more. Good job,man! General Boggs paces nervously, occasionally making a point of looking at his expensive silver wristwatch. He has his hat off. Both it and his bamboo stick sit on Feral's desk. Feral is by the window, looking out at the smouldering ruins of the buildings Dark Kat attacked earlier. Even from this great height we can hear the sirens of fire trucks and emergency vehicles. Callie and District Attorney Mills sit in the guest chairs. Nobody is saying anything. Mills coughs. Time is running out. And so is my patience. So you keep reminding us, General. We're all on the same side, here, Ms. Briggs. We all want Dark Kat destroyed. For good. But not if it means killing the hostages still aboard his ship! She half starts to rise from her seat when Captain Pomeroy comes in. He walks up to the General. Don't talk to me, talk to Feral. Until the last hour is up, it's his and the, uh, acting mayor's show. Pomeroy frowns, then turns to Feral. All business and exuding authority of the sort the petulant and fidgety Boggs could never hope to, the Enforcer Commander approaches the brawny Army captain. Surprisingly, Pomeroy manages to make himself salute. Sir. A helicopter from the Megakat Geological Society is inbound as we speak. The pilot is requesting permission to land. Boggs goes and grabs the telephone and dials a number. Nobody pays him much attention. Callie and Mills jump up and walk over to Feral and the Captain. Grant them permission on the double, Captain! Pomeroy glances at Boggs for confirmation and the General just waves him off. Shrugging, Pomeroy scurries to obey, the others, except for Boggs, following. Yes, this is General Boggs. Please connect me to Governor Clawstone's office immediately. Callie, Feral, Mills, the Sergeant and several commandos and Captain Pomeroy and a few Army soldiers watch as the helicopter lowers down. The rotors power down and the group who left the Fear Ship disembarks. The ones Feral and Callie are the most interested in speaking to, though, are Dr. Ignimbrite and the two Enforcer pilots. You must be Dr. Ignimbrite. The SWAT Kats rescued us and helped us escape from Dark Kat's ship. Can you give our technicians a complete rundown on everything you know about it? What's powering it? Its strengths and weaknesses? Sergeant! Take Dr. Ignimbrite and her team somewhere safe and get them debriefed. The Sergeant takes the Geological Society scientists away. Now Feral focuses on the two Enforcers, Gavin and O'Herlihy. She's still on that thing! She got imprisoned somewhere separately from the rest of us. The SWAT Kats asked us to go with Ignimbrite's people to keep them safe. Everyone else is alive. Including the SWAT Kats! They'll get your niece back. Yes, for once I have every confidence in them. What he noticed was Captain Pomeroy and his men walking off down the runway to meet General Boggs. He's got his hat on again, swagger stick back in hand. He points at a small group of olive drab Army Air Corps fighter jets and their grim-faced PILOTS. Get these men in the air quickly, Captain. I want Dark Kat's flying monument to his own giant ego to be burning rubble within the hour. The two hours aren't up! But almost everyone we were concerned about is now safely off the ship The Governor has given me full authority. Stop Dark Kat now! I won't throw away this opportunity to stop him just to save three people, when so many have died already. He turns and walks off, followed by his men. As long as those two clowns are still alive and on that thing? 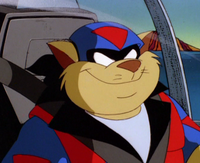 If I know the SWAT Kats, then they'll have her rescued and have Dark Kat destroyed before Boggs' pilots even fire a shot. Callie glances at the Turbokat. Maybe we can give them an edge. Commander, how soon can you have the Turbokat prepped to fly? Sooner than Boggs can get his men in the air! Zeckis leads T-Bone, Razor and Felina into the engine room, where he directs them to the primary engines, terrifying-looking machines with steam pouring off of them. They stare at them. A few Creeplings are tending to the machinery, oblivious to them. Shrieking, the Creeplings glance over and see them. A brief fight follows. The SWAT Kats and Felina charge forward and quickly take out all of them in hand to hand combat while Zeckis hangs back nervously, still seeming uncertain of precisely where he is in all of this. Finishing with the Creeplings, they return their attention to the machines. Razor begins removing a panel, revealing the wiring inside. He sticks his hand inside and begins futzing around with it. Just make sure you set it to wait until after we're safely off of the ship before it goes down. How are we gonna get off, anyway...? We've got some jetpacks stashed up top. You two can probably get out in one of the Enforcer choppers. Razor grunts and swears as he continues attempting to understand and dismantle the wiring and mechanical bits inside of the engine apparatus. Sighing, Zeckis rushes over and begins assisting him, and together they begin working. Dark Kat enters and finds the fight controls destroyed. He is visibly dismayed. He balls up his fists as his enormous form quakes with rage. Zeckis! Where are you? Zeckis! Getting no response, he goes into the laboratory. He stomps down the steps and gasps as he finds the table he'd left Felina strapped to is empty. There's no sign of Zeckis. He flips over a table in a rage, shattering all the antique arcane glassware before before and hitting a button. The fluid in the growth chambers containing the latest batch of Stalkers, which have finished growing, begins draining, and the creatures begin emerging from inside of them. My rage will engulf my enemies! I'll kill the SWAT Kats if it's the last thing I do! General Boggs stands at the window, hands clasped behind his behind his back. Callie lingers uncertainly beside him. Visible below them is the runway. Captain Pomeroy and an ARMY LIEUTENANT are seen overseeing things as the Army jets prepare for takeoff. Behind them, Commander Feral goes and picks up the phone. Feral here. Get me the crew chief on the runway, and hurry. Callie glances over. On the runway, the CREW CHIEF, wearing overalls with the Enforcer emblem, goes and answers a wall phone. Get all of our remaining jets ready for takeoff. Yes now! But tell them to wait for my order to take off. Yes, that means I want them to sit there! That's an order! He hangs up. Outside, so does the crew chief. He runs off. Boggs, having overheard, turns and looks at Feral with a "What are you up to?" look, then turns and watches as the crew chief runs off. Feral ignores him and heads out the door. The Army pilots are prepping to fly. They don't notice Commander Feral marching sternly past them to where the Turbokat sits. With him is the Sergeant. Enforcer jets begin taxing out in preparation for takeoff, situating themselves between the stationary Army aircraft and the Turbokat effectively blocking the runaway. Pomeroy looks annoyed. What are you doing? Move those hunks of junk! They point up at Feral's office window. Pomeroy and the lieutenant turn and look up at Boggs, who just shrugs, confused. Arriving at where the Turbokat sits under guard by two Enforcer commandos, Feral salutes his men. They salute back. Stand down, men. I have need of this aircraft. They glance at the jet they're guarding, and tighten their grips on their laser rifles suspiciously. No can do, sir. Direct orders from that General. Uh, sir. Your COMMANDER has given you a direct order, commando! Pomeroy and the lieutenant start over just as General Boggs bursts through the door and comes charging down the runway as fast as his skinny legs will carry him. His subordinates glance at him, pausing. The commandos look uncertain whether to obey, but one of them steps forward and makes to seize his commanding officer's wrists with an apologetic look, only for Feral to wrench his arm free. The startled commando leaps back and then Feral punches him. The other one raises his gun in reflex, hesitates, and is punched out by the Sergeant as Feral climbs into the cockpit. By now, Boggs has overshot his officers who hurry after him. A gaggle of goggled Army soldiers join them, all rushing towards Feral and the Turbokat. Feral closes the canopy, gives the Sergeant a thumbs up, and fires the Turbokat up. The engines roar to life. The Sergeant steps back, turns and meets the onrushing soldiers who begin fighting with him. He punches and kicks and throws them off of himself, managing to hold his own, but eventually he's overwhelmed, and the Turbokat lifts up and hovers in VTOL mode, wobbling a little as Feral has difficulty with the unfamiliar controls. As the Sergeant is restrained and forced to the ground by the Army troops, the officers rush up. Boggs, his hat flying off, actually leaps up and grabs onto the hovering wing. Stop! I order you to stop! Get in here and make me...! He begins flying away. Boggs clings, screaming. Let go unless you want to fall off and die! "SIR!" As the jet rises higher and higher, Boggs makes a decision and drops, falling several feet to thud painfully onto the tarmac. Callie watches, grinning. Her opinion of Commander Feral has changed drastically. Boggs' men help him stand up. He's fine. His hair is messy and his uniform is rumpled but he's otherwise okay. In the Turbokat, Feral punches the throttle forwards and shoots off over the city skyline. Callie comes running outside. Back on the runway, Boggs is screaming orders. He looks at the Sergeant. The soldiers start to drag the Sergeant off. The soldiers frown, but release their prisoner. Boggs points at Callie. Get everything into the air! Now what, sir...? Do we pursue Feral or go ahead with the attack against Dark Kat...? Forget Feral! Let him rescue his niece and those Enforcer washouts if he can. This changes nothing, just like I said. Dark Kat is history. With a dramatic zap and a flash of light, sparks begin pouring forth from the sabotaged engine components. The four kats back up and shield their eyes. Razor smirks. Then let's get off of this flying slag heap before we go up with it! Quickest way to the hangar? He points to some winding stone steps leading out of the engine room, and they run up them. The engines shudder ominously and continue belching forth sparks and gouts of flame, emitting a loud droning noise clearly indicating something is very, very wrong. Dark Kat walks through, followed by several Stalkers. The group comes into the engine room after the SWAT Kats and their party are already gone and visibly reacts to the sight of the malfunctioning engines. No! My Fear Ship's engines...! The machines continue to emit increasingly more ominous noises, the drone whining to a high pitch indicating an imminent explosion. Dark Kat realizes what's going to happen, backing up a bit. Get out, it's going to explode! He and the Stalkers turn and rush back into the hallway they came out of just as the engines explode, filling the entire room with fire and smoke. The explosion flings Dark Kat and the Stalkers bodily through the air and down the hallway. His teeth gritted, T-Bone charges up, followed by a determined-looking Felina, a weary but still swiftly-moving Razor, a huffing Zeckis lagging a little behind. The explosion rocks the staircase, knocking the wrought-iron safety railing loose. With a yell, Zeckis slips and slides back down, almost falling off of the side. Razor loses his balance and pitches over the side, but grabs on with his claws. Up ahead of them, the shuddering stairs make T-Bone and Felina struggle to maintain their balance. At first it looks like Felina is going to fall, teetering ominously towards the yawning abyss of the great stairwall. T-Bone, despite the quaking, makes to grab her arm. Even as he's trying to grab her, she's hurled back against the center column to which the looping staircase is attached, and top-heavy T-Bone very nearly pitches off to his death down the dark shaft, but a quick-thinking Felina pushes herself off of the wall and grabs his wrist just as he falls. He swings down like a pendulum, yelling, and Felina, squeezing her eyes shut, her muscles flexing underneath her uniform, manages to haul him back up in an impressive show of desperate strength. They collapse and lie there panting. They look over to the dangling Razor. Zeckis picks himself up, slips again, and both he and T-Bone reach Razor at the same time and pull the smaller of the two SWAT Kats up. After some murmured, exhausted thank-yous, they realize the entire staircase around them is beginning to crumble. Come on, this place is crumblin' faster than Grandma Furlong's cheesecake! They continue rushing up even as the steps behind them begin disintegrating, desperately racing ahead of the destruction. At the top, T-Bone rushes through the thankfully open archway, followed by Felina and then Razor. Zeckis, last of all, almost doesn't make it, but Razor turns, grabs him by the chain adorning his Dark Kat uniform and hauls him safely through just as the steps give way underneath his feet. They all get safely through. The crumbled remnants of the stairs rain down upon the engine room chamber and destroy everything. Dark Kat and the surviving Stalkers pick themselves up groggily. Suddenly the floor tilts. The vessel is leaning ominously to one side, tipping slowly and beginning a slow descent towards the earth. The Turbokat roars in from offscreen. At the controls, a wide-eyed Feral watches and begins to circle, looking for any signs of his niece or the SWAT Kats. The Army techs are still manning the consoles while the Enforcers mill around uncomfortably. On the big screen, we see that the traffic on the runway has finally been cleared away and the Army Air Corps jets are taking off. General Boggs, Captain Pomeroy and the lieutenant stand together around a console manned by an Army technician, listening to Feral's transmission. The lieutenant is holding the speaker. ...the vessel is listing heavily to one side. It appears badly damaged and unable to function properly. I think the SWAT Kats actually did it, incredibly. Over. General, he says that Dark Kat's ship appears damaged and is moments from crashing! I heard him, you fool! Give me that! Boggs to Feral! Excellent news, but my orders are explicitly to destroy Dark Kat's ship and whether it crashes or not, my jets are going to reduce that monstrosity of his to molten slag! Do you copy? Over. I copy. But my niece--! You have until the fighters arrive to get her and the SWAT Kats out of there, Commander! That's all I can give you. Don't waste it. Over and out. He hangs up. Pomeroy and the lieutenant exchange looks. Can he really get to them in time? It doesn't matter, anyway. Even if he succeeds, he's still in big trouble, and he'll just be bringing the SWAT Kats back to face trial anyway, isn't that so, District Attorney Mills? He smirks over at Callie and Mills who have just entered. The D.A. looks nervous. Callie just crosses her arms and gives him a gentle little nudge with her elbow. Boggs frowns but shrugs, not caring. Oh, well, whether you want to arrest those vigilante scum or not is no skin off my neck. I honestly don't care about them one way or the other. They can die and it won't make a difference to me. He returns to conversing with his officers. Neither do I. Come what may, as soon as Dark Kat is neutralized, I want him and his jackbooted thugs out of here. I'm acting mayor... it's time I started acting like it. Boggs can only do whatever he wants and march all over us because he has authority from Governor Clawstone, right? Uh, yes, I believe so. And once Dark Kat is dealt with, however he's dealt with, then that authority goes away, right? Then I want you to have the Enforcers kick them out of here the second Boggs doesn't have Clawstone's authority anymore. He may be on our side and just trying to do his job, but he's so boorish and unpleasant he makes Commander Feral seem charming, and the quicker he's out of here, the better. She turns and struts off, high heels clicking primly. Mills watches her go, and manages a small smile, then turns and observes things more closely. To Come: Chance and Jake still have to kick Dark Kat's tail for (what is in my canon) the final time, and face Megakat City's justice. But what idea is it that Callie has to get them off of the hook? And will General Boggs relinquish his control of Megakat City after the crisis has passed, or will he try to take over? Stay tuned to find out! The once mighty ship nosedives and collides with the earth. The craggy bottom scrapes the earth, leaving a deep, mile-long groove before the entire vessel comes to a bone-shattering halt, smoke pouring off of it. The Enforcer helicopters are flung violently across the room to smash against the wall, crumpling. The smouldering remnants of the ship's engines jostle and shudder as the crumbling chunks of the collapsed staircase are flung everywhere. Dark Kat and the Stalkers grunt and steady themselves as they're again thrown violently to the floor. The collapsed statues get thrown around by the impact. The glass cylinders shatters into thousands of pieces. Tables overturn, spilling books, ornate glassware and other scientific and magical brick-a-brack to shatter and spill everywhere. The vessel sits silently, creaking and rocking gently under its own titanic weight, but otherwise unmoving. Molten lava oozes slowly from numerous cracks and ruptures along its surface, as though the ship's very life's blood is escaping. The Turbokat circles around it, Feral searching for any sign of his niece. T-Bone, Razor, Felina and Zeckis lie in a heap in the corner. Felina and T-Bone get up first, groaning, and then help the other two stand up. Razor blinks and looks around. And in one piece, too. Always a good day when we manage to crashland without blowing up. Everyone pauses and listens, hearing the sound of jet engines. Looking around, they see a huge hole in the wall. Sunlight floods in through it. The four of them rush over to it. T-Bone and Razor emerge from a hole in the rocky exterior of the downed airship, pausing as they observing it's a good twenty feet or so to the ground. Squinting into the sky, T-Bone is the first to spot their baby. I don't believe it! It's the Turbokat! Yeah, but who's flyin' it...? Felina squeezes out between them, grinning and waving joyously to the jet. Felina jumps down, landing deftly on her feet. Standing up, she continues waving, trying to get the Turbokat's attention. In the cockpit, Feral spots her and looks about as overjoyed as Commander Feral can look. He starts to wave back, but stops himself, and offers a stern salute instead, which Felina somehow sees from where she is, and returns happily. Feral to Headquarters! I see Lieutenant Feral and the SWAT Kats! They're all alive and well! General Boggs and his lieutenant listen over at the radio as Feral's report comes through. I repeat, Lieutenant Feral and the SWAT Kats are alive! The Sergeant and the assembled Enforcer technicians cheer. District Attorney Mills breathes a sigh of relief. They did it! Those SWAT Kats actually did it! Tell Feral to get them out of there on the double. As soon as they're safely out of the way, we can blow Dark Kat's ship to oblivion, preferably with him on it! The lieutenant turns to relay the order to the Army technician manning the radio. Boggs turns and marches primly from the room, only to find his way barred by Mills and a group of Enforcer commandos. General, I think your work here is done. By the authority vested in me by Mayor Briggs, I'm officially removing you from command of this operation. If you resist, I'll have you thrown out. Boggs blinks, speechless, but decides not to press his luck, stepping back wordlessly. A few of his soldiers are present and hesitantly move to unsling their laser rifles, but Boggs holds up a placating hand, motioning for them to stop. They surrender their weapons to the Enforcers without a fight. As one, the Enforcer technicians surge forward and retake their stations from the Army personnel. The lieutenant and the Army technicians turn the stations back over to their rightful owners and stand back looking defeated but still professional, as things return to normal in the control room. And what about Feral? Remember, he flagrantly disobeyed my orders while I was in command! Or will he be included in that "proposal" you mentioned Briggs having...? Feral lands the Turbokat. Over by the crashed Fear Ship, T-Bone hops down to join Felina. Razor turns and offers Zeckis a hand in getting down. Turning, Felina runs to her uncle as he gets out of the jet and walks over. The two stop and face one another. Feral's massive arms open as though to embrace her, but he stops him, coughs and instead offers another perfunctory salute. Good to see you alive and well, Lieutenant. She drops all pretense of protocol and hugs him. He flinches but then after a moment, hugs her back, his muscular arms all but crushing her in a loving embrace. They remain like this for a moment before finally pulling away and assuming their more traditional professional roles. The SWAT Kats and Zeckis walk over. Yeah, same to you, Feral. Thanks for bringin' us our jet. Although I gotta ask why. Feral puffs up his chest and stands with his arms behind his back. He glances at the crashed Fear Ship. ...although it seems as though there's no need for that now. His gaze lights on Zeckis finally. Zeckis swallows and means to take a step forward and confess his involvement, but is stopped by Felina. Just someone else that needed rescuing from Dark Kat. She smiles and lays a hand on Zeckis' shoulder. Zeckis manages a weak smile. Feral grumps but decides not to press the issue for the moment. Hearing the sound of more jets approaching, they turn and watch as the Army Air Corps begins approaching. T-Bone and Razor look a little forlorn. Deputy M--I mean Mayor Briggs apparently has a few ideas about precisely what's to be done with you two, and knowing her it doesn't involve prison. *MAYOR* Briggs?! What's been goin' on while we were busy kickin' the crud outta Dark Kat? A lot. Now come on, I think it's best we get out of here. Those jets are General Boggs' men coming to finish the job. You haven't met him yet, but believe me, when he says he means to finish the job, he means it literally. We're fortunate enough I just heard over the radio he's going to let us get clear before they firebomb this entire area out of existence just to make sure Dark Kat is gone for good. Then I suggest we take what little kindness has been extended our way and get out of here. Come on. In a secret area of the ship, Dark Kat leads his surviving Stalkers to where a large number of fighter jets are stored. They each have "D" insignia on the sides. Most of them had been sitting parked on the floor when the ship crashlanded, and so they were thrown and jumbled across the hangar and irreparably damaged, but several others were suspended by mechanical pincher mechanisms from the ceiling and still hang there safely, eight in all, plus a ninth jet that is larger and more impressive than the others and includes a silver shield emblem on either side to go with the "D." This would be Dark Kat's personal fighter. To your ships. We'll give those miserable SWAT Kats and their Enforcer friends one final surprise! T-Bone, Razor, Felina, Feral and Zeckis hear a rumble and turn, seeing a group of unidentified fighter jets emblazoned with "D" insignia come shooting out of a previously unseen opening in the side of the Fear Ship. There are about eight or nine of them, with Dark Kat's personal jet in the lead. As they swoop low overhead, Dark Kat and the Stalkers can be glimpsed in the cockpits. Doesn't this guy ever quit? What are those things? Fighter jets for those mutant creations of his! His own personal air force! Dark Kat's jet turns and flies back at them, swooping low and opening up with its laser cannons. The fire pelts the ground around them. Everyone dives out of the way and the enemy jet misses. Cursing, Dark Kat circles away to rejoin his squadron, as they head towards the approaching Army jets. Well, we can handle this. This is right up our alley, right, Razor? Of course! You think I'd come without an armed jet...? Good. You guys should be okay. I doubt Dark Kat will waste any of his firepower on you. It's us he wants. He and T-Bone hop into the Turbokat. T-Bone lovingly caresses the controls. Come on, T-Bone, you can buy the jet a drink after we clobber Dark Kat and his mutant freak army for good! The canopy slides shut and the jet lifts off, turns in midair, and begins flying off after the villains. Feral turns to Felina and Zeckis. We should get clear of Dark Kat's ship. It looks like it's going to blow up with or without Boggs' help! He, Felina and Zeckis turn and begin running off across the field. The Army jets are approaching the scene. In the first jet, the LEAD PILOT frowns as he listens to someone talking to him over his earpiece. What's that? General Boggs has been relieved of command? Huh? Headquarters! We've got bogeys headin' straight for us! General Boggs and most of his relieved men have left. The Army lieutenant and the Army technician manning the radio are still present, due to the fact there are still Army personnel (the fighter squadron) in the field. But this is still clearly an Enforcer-run control room once more, with the Sergeant overseeing things instead of Boggs. Callie enters and observes this with some satisfaction before speaking with District Attorney Mills. The lieutenant says something to the Sergeant. Put the squadron leader on! The Army technician flicks a switch and now they hear the voice of the lead Army pilot. I repeat, we've got bogeys headin' straight for us! Permission to engage! The Sergeant turns and looks at Callie who nods. An aerial battle ensues. The Stalker fighters fly in amongst the Army ones and they begin exchanging laser fire. Although the Army jets outnumber the Stalker ones, the enemy fighters, led by Dark Kat, quickly begin making short work of their foes. Olive green jets, trailing smoke, begin spiralling down out of the sky to crash and explode on the ground. Yes! Destroy them all, my Stalkers! Leave no survivors! Pretty soon only three Army jets remain, including the squadron commander. A jet flown by a Stalker closes in on one of them, its terrified PILOT trying desperately to shake his pursuer. The Stalker growls and targets him, firing a missile, only for it to get blown up in midair before it can hit its target. The Stalker snarls in surprise before it, too, is struck and explodes. The Army pilot gasps and glances back. Dark Kat, observing, is equally surprised, watching as suddenly the Turbokat flies into the fray, blasting away with its missiles. Hiya, Dark Creep, didn't think you'd get rid of us that easily, didja? I'll destroy you two once and for all, myself! He flies off after them, but loses them amidst the chaos of the aerial fighting. T-Bone expertly zips in and out among the smaller jets flown by the Stalkers, allowing Razor to target and destroy two of them. The Stalkers shriek and scream as their aircraft explode in midair, leaving only six enemy craft, including Dark Kat. T-Bone gets on the radio to the leader of the Army pilots. Regroup and stick with us! Roger that! All wings, join up with the Turbokat! The three remaining Army jets join up and begin flying closer to the Turbokat. Everyone watches the battle playing out on the big viewscreen, with three green dots representing the Army jets, six purple dots representing the enemy fighters, and a single blue dot representing the Turbokat. The good guys are slightly outnumbered. Callie turns to the Sergeant. Get some Enforcer jets into the air to assist them! All available pilots to your craft, immediately! Alarms blare as Enforcer pilots run and get into their jets and begin taking off. All right, reinforcements are on the way, boys! Just as he gives this order, laser fire pelts his jet, and he turns to see a Stalker on his tail. I got one of those ugly suckers right on me! I could use a little assistance here! He flies the Turbokat in behind the Stalker that's attempting to shoot down the lead Army pilot. Razor, can ya get 'im in time? One Slicer Missile on its way, T-Bone! He fires. The Slicer Missile heads towards the enemy jet, the three blades unfurling. Just as the Stalker is about to fire, the Slicer Missile cuts into its jet, lopping off the right wing. The Stalker screams as its jet spins wildly out of control, then crashes and explodes far below. He's cut off as a missile comes flying in and broadsides him. His jet explodes in a massive fireball and he's gone. T-Bone and Razor are shocked and horrified. They hear Dark Kat's voice taunting them over the radio, and then see his jet bank in to fly alongside them. You see, SWAT Kats, how quickly victory can be snatched from you! Razor's thin body quakes with fury. As long as I live, no one you try and protect is safe! Then maybe it's time you stopped living... We're comin' for you, Dark Crud! Prepare yourself! 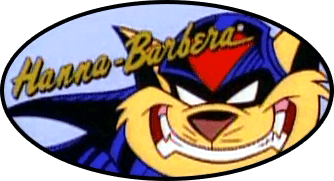 Then stop me if you dare, SWAT Kats! Laughing, he banks away from them. T-Bone pursues him. T-Bone, it's what he wants! He's trying to goad us! Well, it's workin'! And anyway it's woth the risk! As long as Dark Kat is alive nobody in Megakat City is safe! We have to take him out, Razor! Agreed. But we have to take care of these creeps first! T-Bone nods grimly, and returns to the task of assisting the last two Army fighter jets in dealing with the Stalkers. We'll help these guys out first, and then we'll make Dark Kat pay. Down on the ground, Feral, Felina and a very distressed-looking Zeckis peek out from behind a bale of hay. Give them time, Uncle, the SWAT Kats will eventually stop Dark Kat. I just wish I was up there with them...! Maybe you can be! And so can I! She turns and points to a large force of approaching Enforcer jets. As has happened in the past with this particular story, this is on hold for an indeterminate amount of time. I haven't felt up to writing for a while now. I do intend to eventually finish it, if only to satisfy myself and say I never gave up on it.